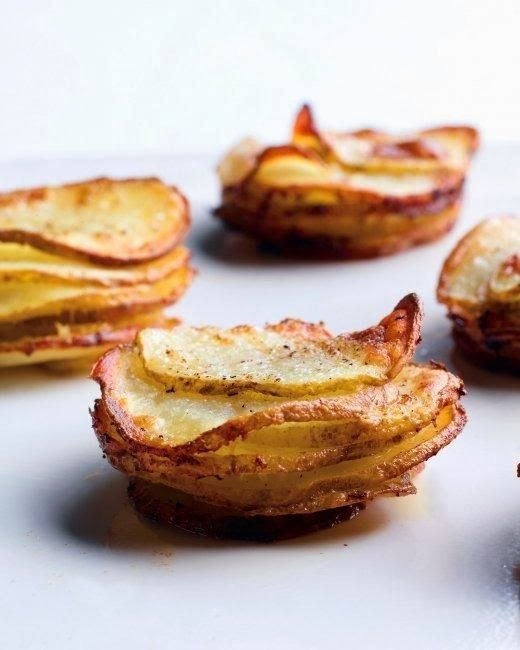 Make these individual potato gratins for Thanksgiving dinner or serve them along with any weeknight supper. They go well with steak, roast beef, chicken, or sauteed fish. Preheat oven to 400 degrees. Lightly brush 6 standard muffin cups with butter. Thinly slice potatoes. Place 2 slices in each cup and season with salt and pepper. Continue adding potatoes, seasoning every few slices, until cups are filled. Pour 1 tablespoon heavy cream over each. Bake until potatoes are golden brown and tender when pierced with a knife, 30 to 35 minutes. Run a thin knife around each gratin. Place a baking sheet or large plate over pan and invert to release gratins. Flip right side up and serve.